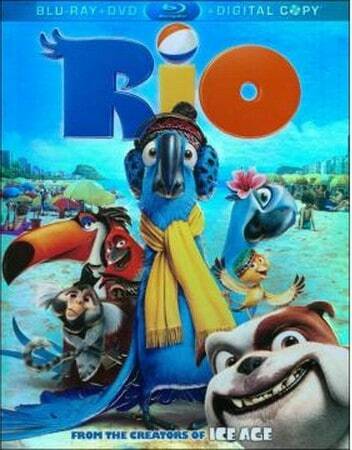 For a limited time at BestBuy.com, you can get a Rio(Blu-ray/DVD) for only $4.99 (reg $19.99)! This is a great set to add to your family movie night movie collection! A fun family movie to watch on family movie night! You can also get the DVD for only $2.99! A misfit macaw named Blu (voice of Jesse Eisenberg) heads to Rio de Janeiro, embarks on a magnificent journey, and makes some loyal new friends in this animated adventure for the entire family. Domesticated from the time he was just a hatchling, Blu traded a life in the clouds for a contented existence in Moose Lake with his doting owner, Linda (Leslie Mann). They live under the impression that Blu is the last of his kind, but upon receiving word that a female macaw named Jewel (Anne Hathaway) has been discovered in Rio de Janeiro, Linda and Blu set their sights on South America on a mission to replenish the species. Shortly after their arrival in the Brazilian capitol, however, the two rare birds fall victim to a gang of greedy animal smugglers intent on making a mint by selling Blu and Jewel to the highest bidder. But the headstrong Jewel isn't about to be locked in a cage and put on display, so when the opportunity arises she stages a daring escape with the help of some wisecracking local birds, and takes her new friend Blu along for the ride. With the bumbling birdnappers fast closing in, Blu realizes that his only hope for making a clean getaway and reuniting with Linda is to finally summon the courage he needs to take flight.